This print and color page is perfect for children and adults. It is one of the most popular Bible verses and has been an inspiration for generations. It helps to memorize the scripture when you color in the words to the verse. 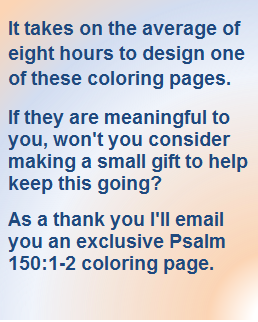 There is a lot to color as you meditate on God's word. 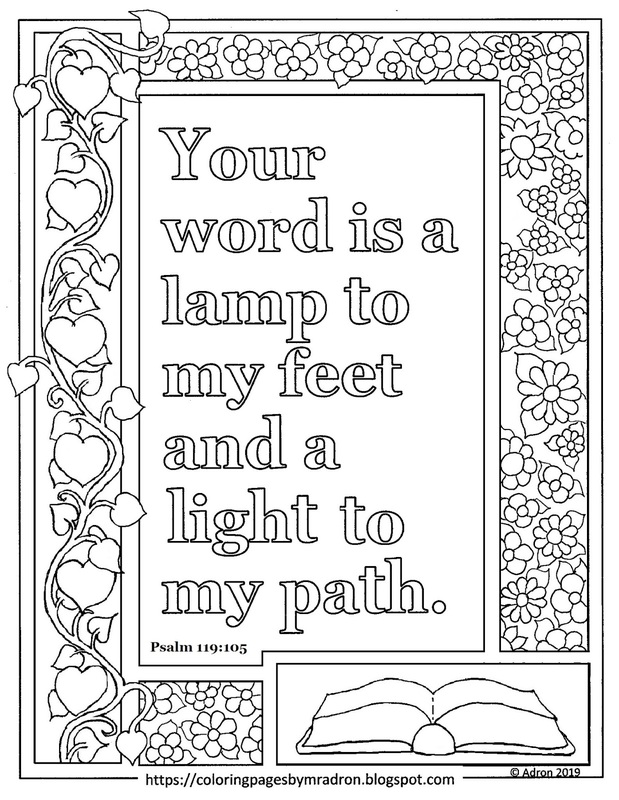 Psalm 119:105 says, "Your word is a lamp to my feet and a light to my path." Psalm 119:105. CLICK HERE to go to a word doc photo file that may work better on some printers. There are a lot of ways that you can color this. The letters are big enough to fill in. There are flowers around the border. There are frame bars that can be colored in. Do not forget to color the background but not too dark. 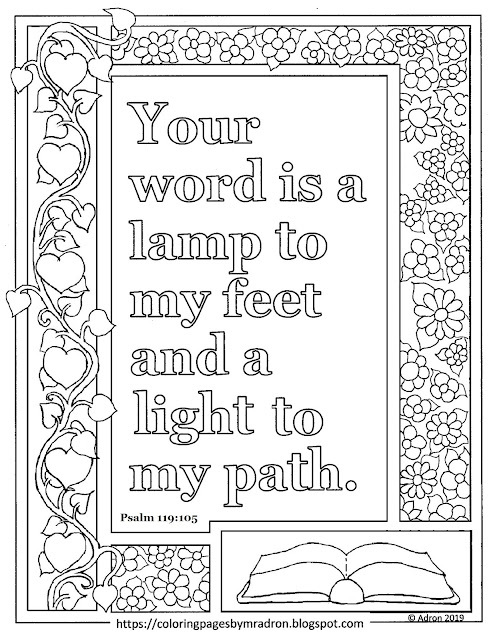 You can use this coloring page in many ways. Family worship time and any place where God's Word is loved. You can print this and take it to church on Sunday to give the little kids some quiet activity to occupy themselves when they get bored. I have a friend who prints these and takes them when she does hospital visitation and gives them to patients in the hospital and rest homes. To find more like this use the search box above or see the favorites in the sidebar. This print and color page is perfect for children and adults. Psalm 34:4 says, "I sought the LORD, and he answered me; he delivered me from all my fears." Psalm 34:4. 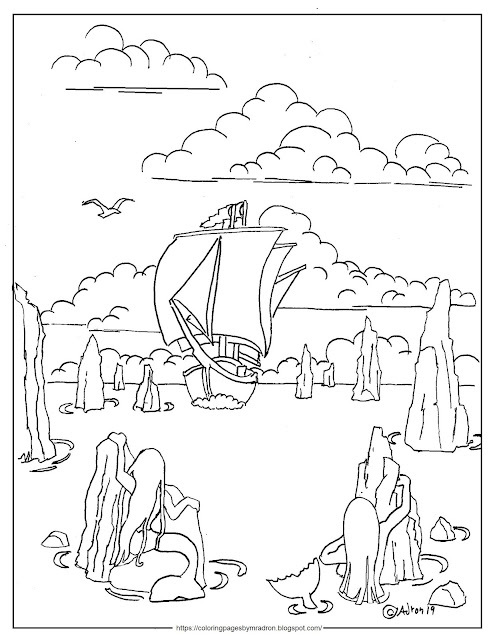 Free print and Color page of a sailing ship and two shy mermaids in a fantasy Ocean scene. This printable coloring page is perfect for children and adults who want to explore a fantasy world where mermaids live. It has a picture of a ship that I drew originally to illustrate a poem in a book of mine. To make a coloring page out of my drawing I added a few points of interest like some finger rocks coming out of the ocean and two shy mermaids looking at the ship. Try printing it and then tracing it onto watercolor paper to make a painting of this scene. There are a lot of ways that you can color this.